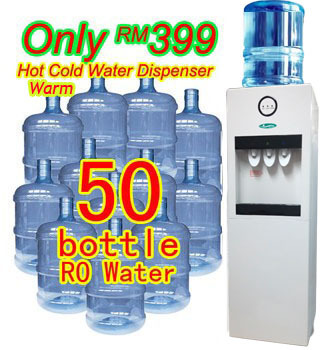 【PLAN399】 Buy 50 bottles RO Water, 1 unit Water Dispenser for use. There are many health benefits of using reverse osmosis water filters. By using this type of water filtration system, you are able to quickly and effectively create water that is considered "pure". It is absolutely essential that we each consume water that is clean and free of toxins so that our bodies can function appropriately, and we can be healthy. When we think of "dirty" water, we most often consider this to be an issue that is only relevant in third world countries. However, due to the industrial industry in the United States, as well as the environmental pollution, we too, have a type of "dirty water". This is why it is important to use reverse osmosis water filters. Nearly every form of tap water, regardless of where it is, contains some form of contaminants. These may include minerals that are natural based, or even chemicals that are actually man-made. Many facilities use chemicals such as fluoride and even a bit of chlorine in order to treat water, but even these chemicals can harm the body over a prolonged period of time. 3. Pure, clean hydration can assist the body when it comes to digestion and even taking the food that is consumed and transforming it into energy that the body requires. 5. Seeing that water helps in the production of new cells, and other body functions, a person can reduce the possibility of immune suppression, or just coming down with some type of sickness. I would like to know term and condition for Plan399 Click Here & Coverage Area / Whatsapp me know about more details. You may also be interested in this Short Term RO Water Plan for Events Click Here & Coverage Area / Whatsapp me know about more details.